Small Gazebo - Who Has The Best Small Gazebo For Sale? A small gazebo makes a garden look more attractive without taking up too much valuable lawn space, which is why they’re becoming an increasingly popular garden building. 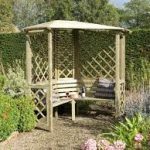 The very best small gazebos can look very attractive, and yet they’re very functional too as they can provide shelter from rain or from the hot sun, and many of them can also be used as a place to grow or display plants. Despite their compact nature, they can also act as a focal point for the garden as a whole, and an ideal place to greet and entertain guests before a dinner party. 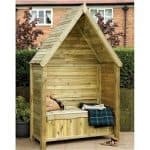 If you want to find the model that perfectly meets your needs, then take a look at this WhatShed guide to the best small gazebo available for sale online in the UK today. The first thing we had to determine was just how big is a small gazebo? For the purposes of this list we’ve defined a small gazebo as any that is smaller than a 10 x 10 gazebo. Within this category we then considered the price and value for money offered by each model, as well as its looks and design features, and any extended warranty or additional features that it may have. In this way we’ve been able to create a definitive league table encompassing the best small gazebo that can be bought online in the UK today, and nine exceptional runners up. 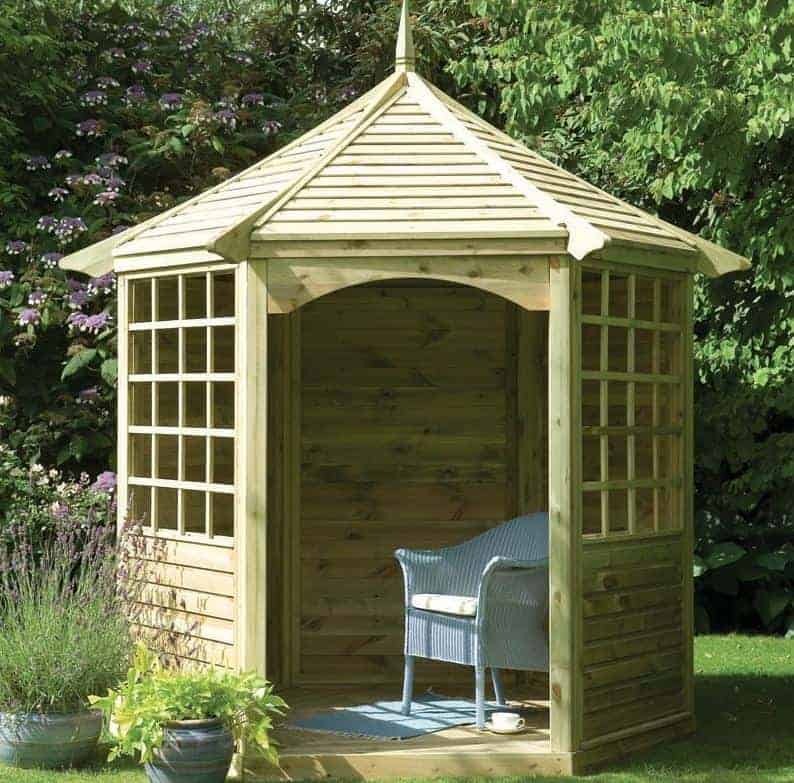 As our WhatShed league table shows, a small gazebo can bring many of the benefits of their larger cousins and nowhere is this more evident than in the Bredon hexagonal gazebo which achieves the accolade of being our number one small gazebo available online in the UK today. It’s not the cheapest we’ve reviewed, but it is well built, attractive, and very durable. Whether you want gazebos, garages, or garden sheds, WhatShed will bring you the independent reviews that can help you find exactly what you’re looking for. One of the great things about a small gazebo is that it’s ideal for a compact garden, but that doesn’t mean that it can’t still look beautiful. We were struck by the appearance of this hexagonal gazebo at first sight, thanks to the mixture of styles contained within it. Adjacent to the open front, allowing easy access, are two balustraded sides, and the other three sides feature attractive lattice work above a half boarded base. With a tall apex roof above sliding any rainwater away, this makes a very light, airy, and attractive garden shelter. With base dimensions of 2.34 x 2.03m, there’s enough room inside for up to three people to relax and look out at the garden, and we liked the integrated three sided bench that’s been provided for this purpose. We were also impressed by the initial pressure treatment that the manufacturer has used on all the timbers, especially as that means they’re able to provide a long lasting and very reassuring 15 year guarantee against rot. We have reviewed cheaper gazebos, of course, yet for such an attractive and durable small gazebo we still feel this represents more than reasonable value for money, and it’s this combination that earns it the top position in our highly competitive league table. This six sided small gazebo shares many qualities with the top ranking gazebo above it, which is no bad thing of course. With base dimensions of 2.29 x 1.99m however it’s slightly smaller and it doesn’t have the diamond shaped lattice work across three panels that the Bredon gazebo, and even though it costs fifty pound less these factors were enough to ensure that it has to settle for the runner up spot in our WhatShed league table. Nevertheless we still found this a very attractive garden building, and we can imagine it becoming a talked about feature as well as being a highly useful addition to a property. In place of the diamond latticed sides there are three fully boarded panels, and these are boarded by two half boarded panels with Georgian style unglazed windows. This gives a very decorative finish, and it also provides excellent protection against rain and snow. You won’t have to worry about the effects of precipitation on the wood itself because it comes with a long lasting pressure treatment and a 15 year guarantee against rot. This is something that we always like to see in a small gazebo that costs upwards of a thousand pounds, but it’s not always included, so in this instance we feel it’s a welcome value adding feature. This is the most compact small gazebo in our top ten league table, with a base width of 2.10m and a base depth of 1.82, although for many people this will be one of its advantages. We feel that it’s a perfect choice for those whose garden space is at a premium, and as the apex roof reaches up to a peak height of three metres it still feels surprisingly spacious inside. One other thing we liked about the roof is that it has been tiled to give it a very attractive shingled effect. We found the gazebo as a whole to be very eye catching, as it also boasts balustrading around five of its six sides and decorative curved eaves. J-Class are known for the high quality components that they use in their garden buildings, and we were pleased to see that this applied to their small gazebo too. All the timber used is sustainably sourced, pressure treated, and guaranteed against rot for 15 years. We were also impressed by just how thick the timber used is, with 20mm thick spruce being used for the floor, which itself is supported upon 65mm floor joists. The result is that this is one of the strongest and most stable small gazebos we’ve reviewed, despite its size. This unique garden building combines the appearance of an arbour with a small gazebo, and this creates something that’s very functional as well as being very pleasing on the eye. In effect it is a compact sized hexagonal gazebo that’s been cut it half. This gives a wide open front making it easy to move furniture or goods in and out. This wide frontage measures 2.81, but as the corresponding depth is only 1.28m this still meets our criteria for selecting small gazebos. We feel that this would be an ideal place in which to entertain house guests on a summer evening, with the open front giving an unimpeded view of the garden. There are three integrated benches as well for this purpose, and the solid apex roof above this area ensures that it’s protected from the ever unpredictable British weather. 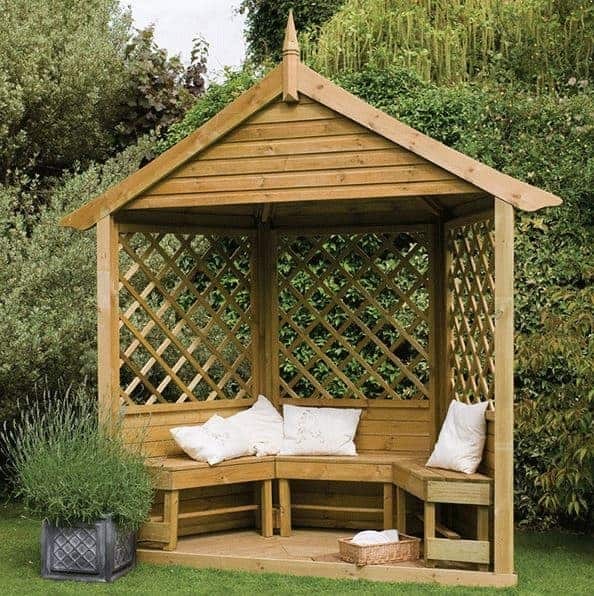 The three sides all feature trellis work, which adds to the aesthetic appeal, and once again all the timber including the tongue and groove floor and roof has been pressure treated and so comes with a value adding 15 year guarantee. As this is already a very good value small gazebo, with a price tag of well under a thousand pounds, it deserves its place in the top half of our top ten league table. Once again, we have a building with a look of its very own in the top half of our top ten league table, and once more its good looks have helped it secure such an elevated position when combined with the other features it offers. 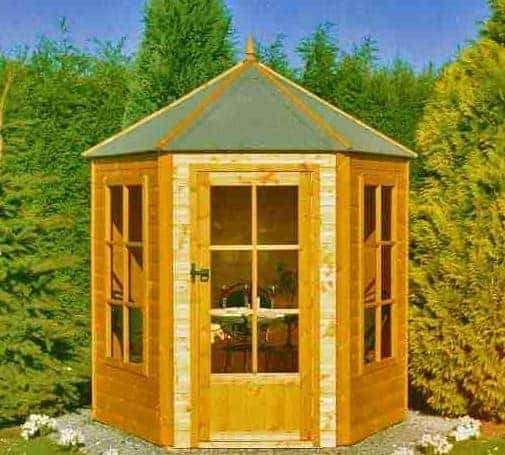 This building is a combination of a small gazebo and a compact summerhouse, in that it’s a free standing six sided building but on this occasion it has a single hinged door for an entrance rather than an open face. That not only creates a very attractive building that will add character and style to any garden, it also creates a secure environment in which goods can be stored , although a padlock would need to be added if it was to be used for this purpose. The door and its two adjacent sides are fully glazed, so lots of light reaches into the interior, although of course it’s not as airy as a traditional small gazebo. We were pleased to see that horticultural glass has been used for the glazing to give it a little extra strength, but it may still not be ideal for areas where young children are going to be playing nearby. 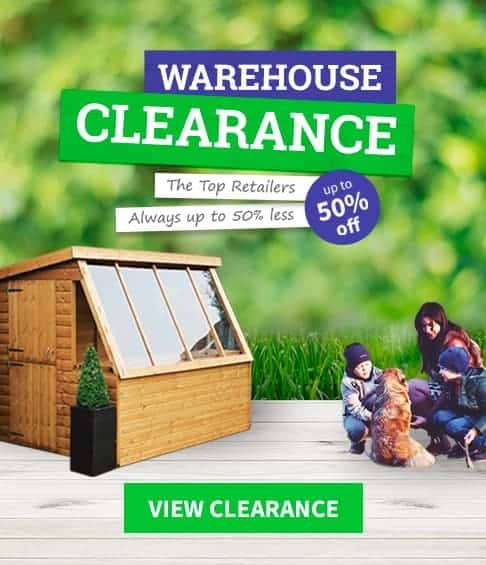 We were also a little disappointed to see that it comes without any extended warranty period, but on a more positive not it does represent very good value for money for such an attractive and versatile garden building. 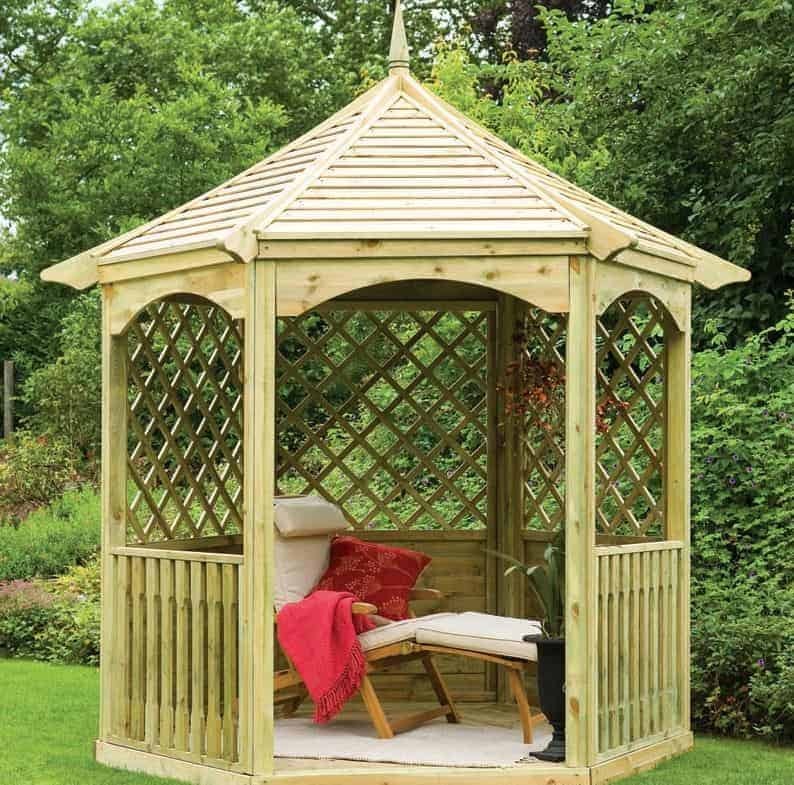 If you’re looking for a summer retreat to relax in and at the end of a working day, then this small gazebo from M&M could be a perfect choice. 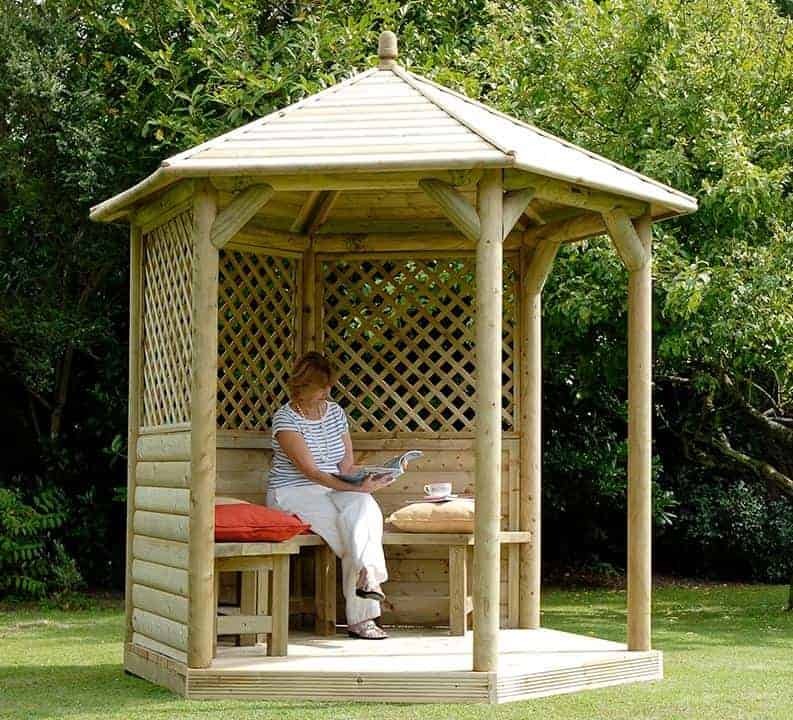 This is in one of the most stylish gazebos that we’ve reviewed, and yet with base dimensions of 2.50 x 2.10m across its six sided design, it won’t take up too much room from the garden itself. Nevertheless we can easily imagine this becoming a talked about garden feature in its own right, and it’s a great excuse to invite friends and relatives around. The thing that immediately struck us upon seeing this gazebo is that it has a wide open frontage, with only the rear three sides being panelled. These panels have solid infills at the bottom and then a trellised section above. This helps to provide shade on a sunny day, and of course it’s an ideal place to grow climbing plants thus creating an even more impressive appearance. We were pleased to see that pressure treatment has been used, as this long lasting solution against rot carries with it a 15 year guarantee, and means that the customer doesn’t have to carry out yearly retreatments. With so many high quality features, it’s only the higher than average price tag that prevents this small gazebo from being ranked much higher. This is the second eight foot by seven foot gazebo from M&M to make our WhatShed league table, but what makes this one stand out from its compatriot, and indeed from any other small gazebo that we’ve reviewed, is that it has a thatched apex roof. The thatching is applied in five stages, creating a very pleasing and unique look that will make your gazebo stand out for all the right reasons. 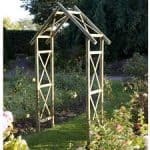 We feel that this rustic appearance will look even more impressive if plants are grown across the three trellised panels that make up the rear section of the gazebo, but even in its bare form it’s certainly eye catching as well as being very effective at stopping the progress of rainwater. As with the timber roof version above it, there’s an open front containing just two strong support pillars leading up to the roof so it gives excellent views of the garden before it. We also liked the strong deck that serves as a base, and as it has been pressure treated it’s very resistant to the threats of wet rot and ground moisture. To make this small gazebo even more attractive it’s possible to add sets of curtains and roof linings, although this does add considerably to the initial price. 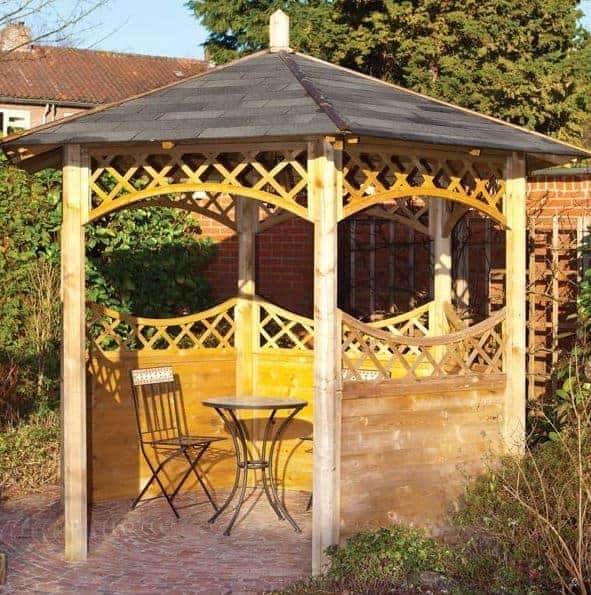 It has to be said that we prefer the look of this gazebo to the timber roof version, but as it costs three hundred pounds more it finishes lower in our list. 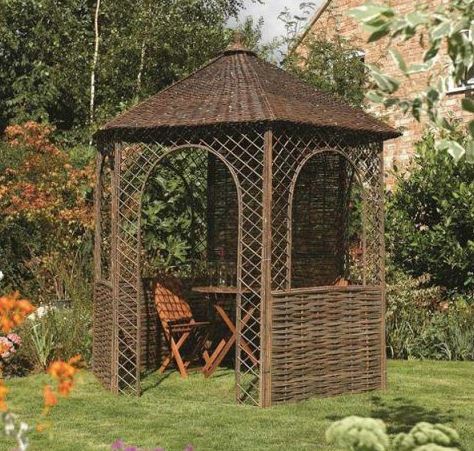 This is the only small gazebo we’ve reviewed that’s made of willow, rather than timber, plastic or metal, but that brings some real advantages to the consumer. Foremost among these is that this particular model is very affordable for a gazebo that has base dimensions of 2.48 x 2.15m, with a ridge height at the summit of the apex roof of 2.65m. 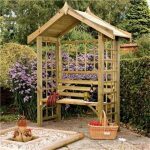 This means that for an outlay of not much more than three hundred pounds it’s possible to have a garden shelter that can also be used for growing plants, thanks to the trellis work around the arched windows that occupy four of the sides. By emulating the style of a traditional timber hexagonal gazebo, yet in a very different substrate, it looks original yet attractive. One other advantage of willow being used is that it’s surprisingly tough and durable, especially if it’s given a protective coating of linseed oil. It’s also an environmentally friendly material, which is something that we always approve of in garden buildings of all kinds and sizes. 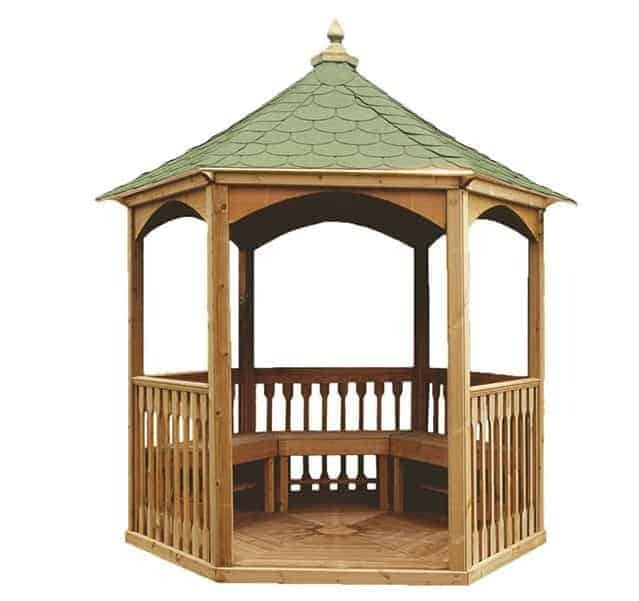 If you want to buy a small gazebo on a small budget, then this should be at the top of your shortlist even though it lacks the bells and whistles of some of the other gazebos within our league table. This qualifies as a small gazebo according to our definition by having a base area of less than a hundred square feet, and yet with a width of 2.97m and a depth of 2.37m this is the largest gazebo to gain a place in our top ten league table. This means that whilst it’s still suitable for compact gardens it’s ideal as a place to sit with friends and families on a warm evening, and can be a great location for the start or end of a dinner party or as a bar or covered barbecue area. We were impressed by just how stylish this size sided small gazebo looked, especially as it’s embellished with decorative details underneath the roof and at the top of the half boarded panels. With a pressure treatment applied by the manufacturer we don’t doubt that this will be a durable and rot resistant gazebo as well, but the lack of any extended warranty as confirmation of this is the reason that this very reasonably priced garden building doesn’t gain a position higher up our league table. 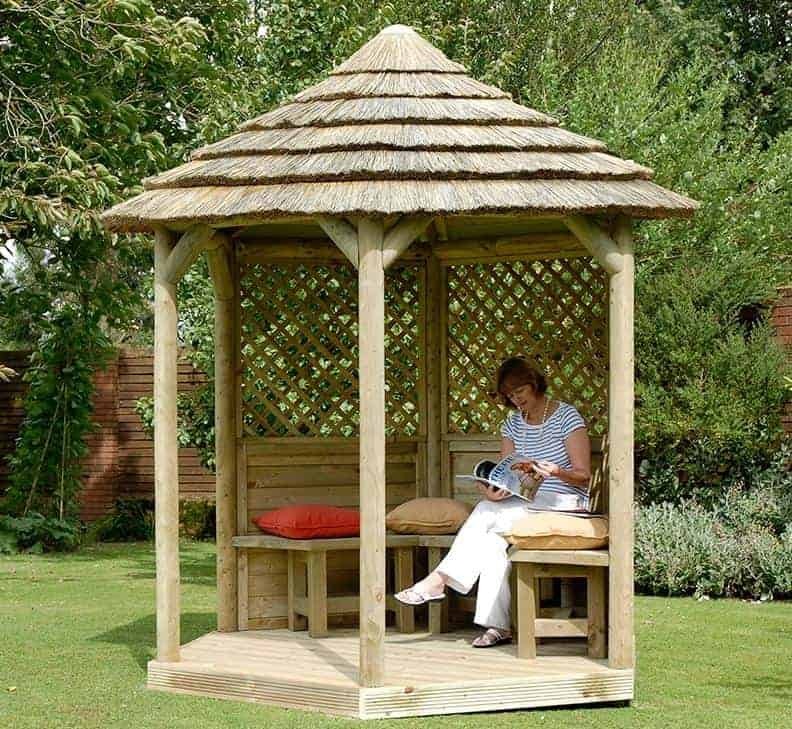 Nevertheless, it deserves to be considered by those wanting a little extra space from their gazebo without having to pay too much more than a thousand pounds. 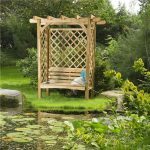 This is without a doubt the most attractive small gazebo that we’ve reviewed, so it can brighten up any garden environment. The first thing that struck us upon seeing it was its octagonal design, as we normally only see eight sides used for larger gazebos. This means that whilst the base measurements are 2.50 x 2.50m, there’s a little less room inside than this suggests because of all the cut away corners. There’s still more than enough room to enter a couple of guests within its sanctuary, however, and benching runs around seven sides to facilitate this. 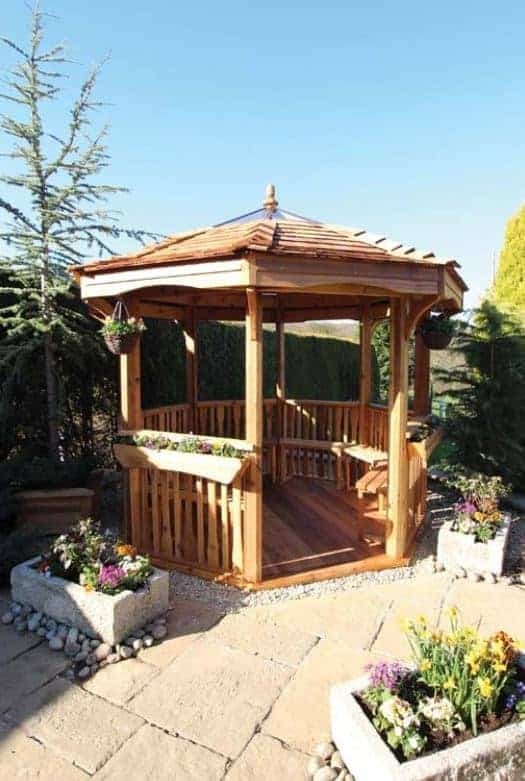 As well as being attractive, this is a very high quality small gazebo, as shown by the use of cedar timber throughout. Cedar contains natural oils that make it very rot resistant, meaning that it doesn’t need the harsh preservatives that many other timbers need. We’re always pleased to see timber used for garden buildings, from gazebos to sheds, for that reason, but we would have liked to see it come with a long warranty period as well. The superior quality components also come with a high price, making this by far the most expensive gazebo in our league table. If you have a budget that stretches beyond four thousand pounds however, and want a small gazebo that has quality written all over it, then this could be the perfect choice for you.